For some, this week is a time of self-reflection and repentance for sins or mistakes one has made over the past year. In the spirit of this reflection, Dr. Morty Fein and I teamed up to bring you this blog post. The general theme here reflects on MSE, because at its core, the concept is flawed and we are hurting honest people by employing policies based on pseudoscience and flawed data. The hurt caused to chronic pain patients requiring long-term opioids is something upon which PROPagandists, lawmakers and third payer policy makers should reflect. The glaring imperfections of MSEs are outlined in the Academy of Integrative Pain Management’s White Paper posted on their website just this month, entitled Opioid Dosing Policy:Pharmacological Considerations Regarding Equianalgesic Dosing. And now, PROPaganda is taking a page from former NY mayor Mike Bloomberg’s roundly criticized policy attempting to place limits on the size of soft drinks, a policy that got everyone riled up about the “nanny state.” Heaven forbid anyone try to help people limit their self-destructive behavior this way. They will all just buy multiple drinks people argued. And how dare Bloomberg tell me how much sugar I can ingest at one sitting, through one straw, from one barrel? The anti-opioid lobby have defined a new target – ultra high dose unit opioids (UHDUOs) – and they have petitioned FDA for the removal from the market. MSE limits, “pill” limits, duration limits are not enough for them. Their next PROPosterous PROPosal is for people with cancer or those being treated for severe pain by a pain expert (and therein not allegedly subject to CDC guidelines and other artificial and unscientific limits imposed by the payors and some states) to take mouthfuls of tablets or capsules from their oversized prescription bottles that have even more dose units for sale or use by their kids. The Bloomberg analogy breaks down here because those patients who need higher strength dose units are not being self-destructive they are simply taking their medicine. With upwards of a quarter of people with pain in one survey endorsing problems with swallowing their medicine, this seems cruel and unusual to make them take twice as many and more pills or capsules. Limit upon limit upon limit upon limit. They are a broken record. Prescribing is down 15-20% and yet the death toll keeps rising. And everyone acknowledges that the abusers have moved on to heroin and illicit fentanyl in any case which is why our policies are failing. But let’s keep searching for our lost keys on the side of the block where the light is better even though we lost them on the dark side of the street. WAIT. I HAVE A BRILLIANT IDEA. Let’s subject heroin and illicit fentanyl dealers to MSE limits. And let’s eliminate their UHDUOs. We can have a campaign, Kudos for the elimination of your UHDUOs. While we nickel and dime people with pain, heroin dealers are offering the world limitless access and you don’t even need to deal with some insurance company bureaucrat to get what you need. You do need to pay cash though and break the law and take your life in your hands but hey that’s not as bad as a prior auth. Or being humiliated at your pharmacy or dealing with your burned out, surly healthcare provider. We can’t even calculate the MSE limits for the average illicit fentanyl product laced with impurities such as bootleg carfentanil and we know that doses of carfentanil alone must exceed limits because they can be used to thwart a Chechen terroist attack. Heroin on the other hand we can calculate, because pure heroin (unlaced) is diacetyl-morphine which in essence is two morphine molecules on either side of a 2-carbon chain (an acetyl group). That acetyl group is similar to what we all know as vinegar. 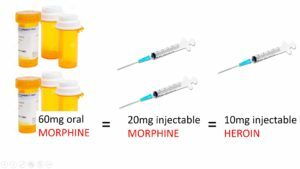 A typical snorted or injected dose of heroin ranges from 5-20mgs and injectors use on average about 4 times per day. A habit of 5-20mgs four times daily means a total daily dose of 20-80mgs per day for an MSE of 40mgs to 160mgs MSEs. Thereby, many not even very heavy users are able to use at a dose that exceeds the top of most states’ MSE levels but of course your friendly neighborhood dealer won’t stop there. It is time to move towards clinically sound solutions to prescription opioid abuse, diversion and overdose that don’t continue to attempt to solve the problem of heroin and illicit fentanyl abuse by further penalizing if not torturing law abiding citizens with chronic pain. More adequate reimbursement for clinician time and the use of reimbursed tools such as urine drug monitoring and the time it takes to understand trends and results of prescription drug monitoring program (PDMP), and sensible policies that allow safer and faster access to the potentially safest products and even the removal of MSE ceilings for drugs to which they don’t apply, would be a start. But it sure would be nice to get focused on the problem as it exists now as compared to a few years ago. Bloomberg was just trying to protect us from ourselves; pain patients don’t need PROP to be their nanny. Kaiko RF, Wallenstein SL, Rogers A, et al. Relative analgesic potency of intramuscular heroin and morphine in cancer patients with postoperative pain and chronic pain due to cancer. NIDA Res Monogr. 1981 Feb;34:213-9. Reichele CW, Smith GM, Gravenstein JS, et al. 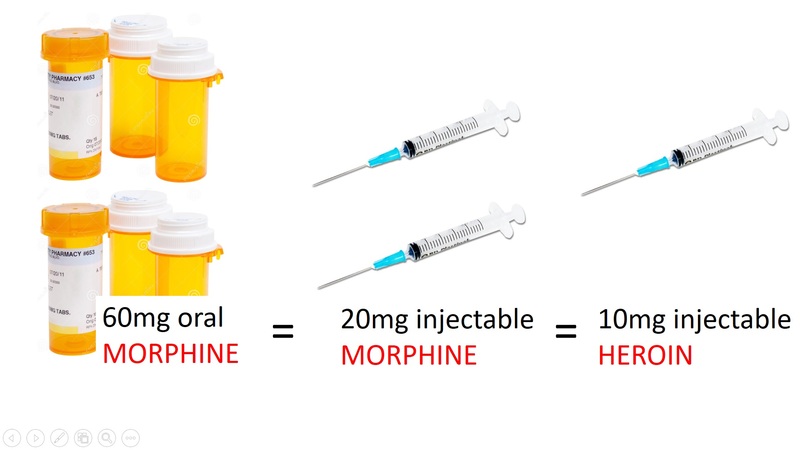 Comparative analgesic potency of heroin and morphine in postoperative patients. J Pharmacol Exp Ther. 1962 Apr;136:43-6. N Engl J Med. 1981 Jun 18;304(25):1501-5. Kaiko RF, Wallenstein SL, Rogers AG, et al. Analgesic and mood effects of heroin and morphine in cancer patients with postoperative pain. N Engl J Med. 1981 Jun 18;304(25):1501-5. Thank you Dr. Fudin for your amazingly informative article and fighting for all of us and the human rights of every citizen! I feel very strongly about this topic like im sure alot of people who live with chronic pain on a daily basis do. when the government, Dea or cdc talk about the epidemic and how they are going to solve it by puting more regalations on prescribing and manufacturing it really gets to me. first when has the goverment ever made a problem better? second why are people in Washington telling doctors who go to school for alnost a decade to get there licence how to treat people that walk into there office looking for relief from any condition. Thrird how is it that a pharmacist can denie or lecture a person on the medication them and thier doctor decided on. I have lived with pain every day of my life since i was 15 years old from serious sports injuries, if it wasent for 5mg of vicoden i would have never made it through college, when people talk about taking away options for people in chronic pain they are talking about people’s lives there familys lives. It is not a one size fits all as anyone knows who has been in pain management for any period of time the medication you start out on dont work as well as they did when you started, now this period of time is diffrent for everyone. I am 15 years in to taking pain medication, the 5mg vicoden i started out on gives me no relief now, so after 15 years im on a dose of 15mg oxycodone 4 times a day. this gives me some relief but nothing ever takes the pain completly away. so now when i go to the pharmacy all they see is oxycodone 15mg and i get the look, and im sure most of you have gotten it before. Is this guy a drug addict or drug dealer, then they say ” hang on i have to ask the pharmacist if we have this in stock” then they both look at the script and look at you, then come back and say yes or say sorry its not in stock. if its yes you take a deep breath and say thank god, if not you have to go throught maybe 5 or 6 times at diffrent pharmacies till you find your medication. This is what a chronic pain suffer gos through just to get a legal drug it is crazy and i will admit there was a period of time i went to the street to get my medication it was so easy i knew my dose knew the guy who had it and paid cash that easy. I knew it was not legal to do this but my option at this time were totally and completly exuhsted, belive me i tried everything to get into another pain clinic but it did not hapoen for months because of my age at the time every place i went same thing, you need a knee replacement we cant help you, i understand i need a knee replacement but the numerous orthopedics i went to would not do it because they said im too young. so being in limbo i turned to other means. I only write this to hopefully give people an incite to what is happaning to ordinary law abiding citizens who live with chronic pain on a daily basis, and i pray they understand that my story may not be your story but it could be and the current system we have is failing the chronic pain suffer and our society. Careful, bro-bro; Anne-Droo may sick his attorneys on you! LOL! I suffer with chronic, debilitating osteoarthritis. In spite of this I try to live a fairly active life for a 75 year old female, knowing this will only help and not harm me. If it were not for the Norco that my pain management specialist prescribes I know how much harder life would be. I thank the stars each day that I have this luxury, but with opioids so much in the spotlight I am afraid this might be taken away from me. Point in mind, I had to bake cookies for an upcoming wedding, and after standing several hours in one position I could hardly bring myself to climb the steps for bed. All joints were excruciating and so stiff. I was able to take two of my prescribed pills for some relief. I don’t know how to appeal for someone to help me except to write to you and hope you can forward this email. I cannot take Advil, etc because they tear up my stomach. I have tried all ways to reduce pain, but two Norco tabs when needed seems to,give me the relief. My insurance company is putting limits on it, so I know come the first of the year I will have to ask my doctor for assistance and pray they comply. Thank you so much for your wonderful articles, Dr. Webster, and please forward any information that may help with this fight. I do not want to be punished because others are using these drugs for recreational purposes, when I so truly need them. Has anyone noticed that anyone/everyone that is unhappy about what is going on with legal/illegal opiate use … are seemingly SUING EVERYONE… who touches a LEGAL OPIATE… 40+ state AG’s are suing or threatening to sue nearly everyone in the pharmaceutical distribution network… that is all entities EXCEPT the pts that have a valid medical need for using a opiate or other controlled substances to treatment, maintain their appropriately diagnosed disease issues. Did the CDC actually have the legal authority to create those “guidelines”… addiction is NOT A DISEASE.. .it is a symptom of a undiagnosed/untreated mental health disease. Does CVS as a pharmacy or as a PBM.. have the legal authority to over-write the opinions of a legally licensed prescriber… the same goes for the insurer Anthem or other insurers. If the insurance policies that they issues covers mental health issues… abstinence is NOT A TREATMENT for mental health issues. You are always so wise Steve 🙂 and always have your astute eye on the pulse of the issues at hand. We love your articles here at The Insufferable Movement on Facebook, and we need more Pharmacist speaking out like you on the truth. I agree, and encourage everyone to file lawsuits against : Any place that has discriminated against your medically nesesary need for pain control and use of narcotics, denied access to treatment, abandoned patients in a critical point in care without medical support nor meds (which is always in an IP patient) file complaints to the AMA, medical boards not inforceing their own ethical standards nor punishing PCPs and ERs for ‘refusing ‘ to treat IP, palliative and chronic pain patients, Our own government! For allowing our Constitutional amendmented Rights to be violated and for the numerous violations to our human rights and civil liberties violations, ADA violations as well…. We Must make Noise! And start fighting back hard. To my knowledge there isn’t currently a class action going on nor fund but agree it’s needed and we plan to strategically fund raise soon for the day when it’s needed by someone with something big rolling . I know now Marine Vet Robert Rose Jr. of TN is sueing the VA and CDC for guidelines and needs our support . Where was all of this brilliance a century ago, when the racists at Harvard were busy inventing the Harrison Narcotics Act and the US precursors to the Nuremberg Laws on Race? Diacetyl Morphine is a kind of name that just isn’t scary enough to justify fear. Especially since 2011, when it got proven that morphine is made endogenously in all plant and animal species, where it complexes with nitric oxide inside cells, as part of the regulation mechanism that tells mitochondria to speed up and slow down food metabolism via the Krebs cycle. Acetate, that’s normally in the body. Morphine, that’s normally in the body. Having both things in the body is evil because WHY? The Drug War is inherently racist, right back to the day it was first thought of. There’s no way to remove the racist stain from any of the ideas that form any part of it. Not even electing a Black president can undo the fact, that racists invented the Drug War to serve a racist political agenda. Not even the fact that said former president helped escalate that Drug War into a war on pain patients…as did his predecessors. The way to end the racist Drug War on Pain Patients is to address the racism head-on. The Drug War was never about protecting people from dangerous drugs. It was about making it a crime in America, to be caught using drugs while Black. And some of its most vocal supporters, like Dr Edwin Katzen-Ellenbogen, left America when we weren’t moving fast enough with that campaign to make them happy, and took jobs in Nazi Germany’s government. Katzen-Ellenbogen used to be New Jersey’s public health director. He throttled up the Drug War and also got laws passed to force people to get sterilized so they wouldn’t breed. When he emigrated, he had several posts in the Nazi government, ending as Kommandant of the Buchenwald Death Camp, where he killed 33 thousand people and then got a life sentence for doing that. What a career! This drug war is ANTI- HUMANITARIAN!!! We will win with insouciance!